You might not think that would be a problem when visiting local cemeteries, but you'd be surprised. 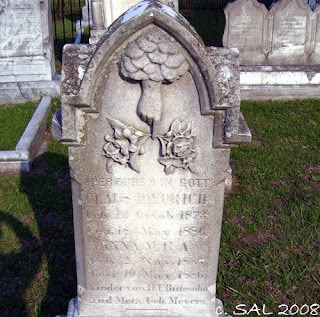 A huge cemetery in Macon, GA named Rose Hill has several hundred tombstones on which the Hebrew language is dominant. 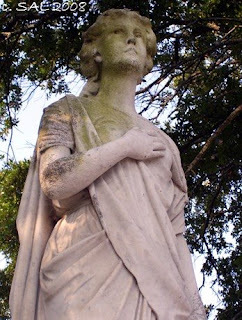 A cemetery in Charleston, South Carolina named Bethany is the final resting place of many German immigrants. Their native tongue is found on their tombstones. And even in little Bonaire, GA I came across the German language inscribed on a stone. That's just a few examples of some Southern Graves not in English. So are we graveyard rabbits supposed to just say, "Oh, well. I don't know what that says," and move on to the next stone or cemetery? Absolutely not! First, we make sure we take great pictures and transcriptions. Then all we have to do is visit a website all of us have visited many, many times before -- Google. From their homepage, click on Language Tools. You will be taken to a page that lets you input the text and with the click of a button, it is translated for you. You can also go directly to translate.google.com. Here are some examples of text from gravestones from Bethany Cemetery (mentioned above) I was able to translate from German to English. Below this angel atop the tombstone for Henry & Elizabeth Knee is the phrase "Zur Erinnerung An." This translates to "As a Reminder to." Darius Gray Ornston, Jr., M.D.